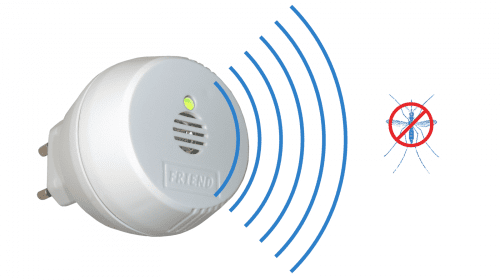 BabyFriend is an advanced electronic instrument that protects you without being noticed and leaving the air that you breath free from any odor. BabyFriend sets you free from mosquitoes with imperceptible ultrasounds. BabyFriend diffuses ultrasounds at a wide range that cannot be audible for humans. The working frequency varies automatically from 22 to 28 KHz to avoid an addicting phenomenon and disturbing mosquitoes of different species. With a very fast wave sequence BabyFriend diffuses ultrasound waves of different frequencies to cover the whole sensitivity arc of mosquitoes. You cannot hear it; it does not disturb or bother you. The ultrasounds stun the mosquitoes that move away from the place where BabyFriend is working, or they have troubles in flying and they cannot sting anymore. 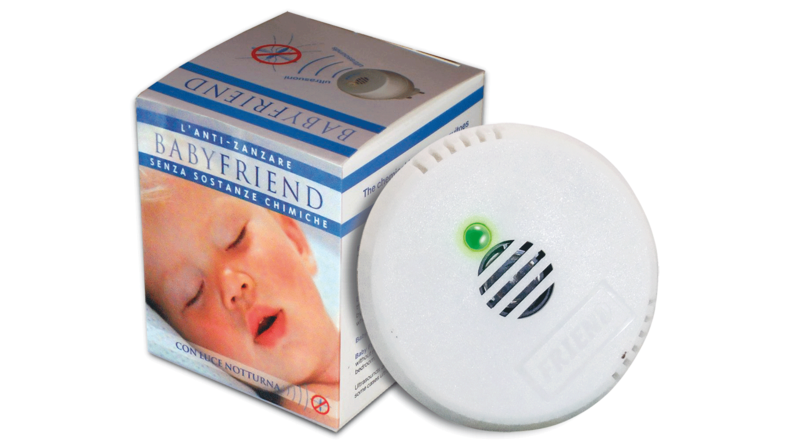 BabyFriend does not diffuse any substance in the air. 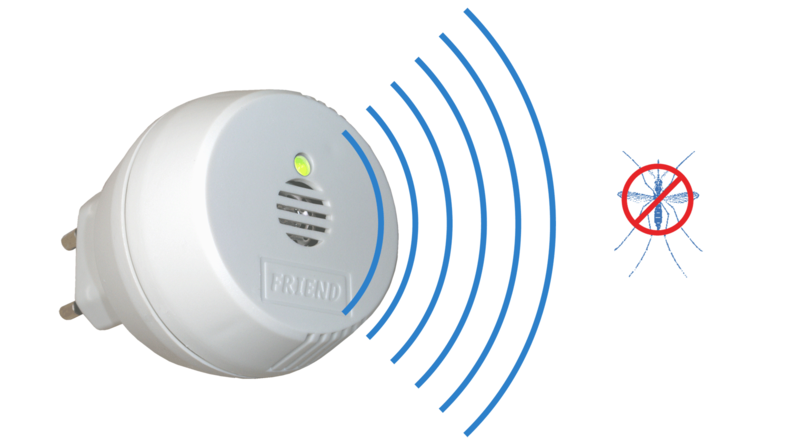 With BabyFriend you will not need to ventilate the room before entering it. You can keep it on as long as you like, even when you are in the room. For this reason, BabyFriend is the most environment-friendly solution to get protected from mosquitoes. It is a true friend for everybody and above all for children. BabyFriend is effective if it is switched on before mosquitoes come; on the contrary you will notice their effectiveness half an hour after the switching on at least, i.e. when mosquitoes have already had their ‘meal’ ……. at your own cost. Try to imagine a person forced to enter in a room with a very high noise. At the beginning he resists, but with the passing of time he will not be able to stand it and will suffer terrible headaches, making him unable to concentrate on his work; so, if he could, he would leave the room. But if he was not forced to enter it, he even would not have tried to. A mosquito acts in the same way when trying to enter a room full of ultrasound waves. But if when you turn on the device, the mosquitoes already are in the room, for some time they will be able to bite you. In order to have the best results, it is always necessary to read the operating instructions carefully. BabyFriend: with a green night-light. BabyFriend is a great friend especially for children, because it diffuses a relaxing and reassuring green night-light. If you keep it on day and night, it protects your children against mosquitoes and calms them down when they sleep. Turn the device on before the night, to act preliminarily and to avoid the mosquitoes entering the room. Thanks to its very low energy consumption (in 150 hours, BabyFriend consumes as much as a 60W light-bulb does in ten minutes), it can always be plugged in. In wider rooms, (more than 15 mq), it is preferable to use two devices simultaneously, connected to two different plugs, to ensure a total covering. The same is for rooms with carpets, with fabric wallpapers or that are furnished with wide upholstered furniture or with thick curtains: as a matter of fact, the rooms’ fabric components can absorb a part of the ultrasounds, thus reducing the device’s action. Check that the plug is not hidden or covered by furniture (fig. 1) or curtains (fig. 2). You can use BabyFriend also when the window is open, as long as the plug is not too close to the window and that the device is oriented towards the inside of the room (fig. 3 e 4). If, in the room to protect, there are plugs on different levels, preferably use the higher ones (fig. 5). In carpeted rooms, if all the available plugs are less than 30 cm from the floor, it is better to use an extension cable and place the device in a higher position, for example on a desk or on a shelf, orientating it towards the inside of the room (fig. 6). The defensive action starts right away and is effective just after a few minutes; this is why it is advisable to turn BabyFriend on beforehand. Obviously, if you want to get rid from mosquitoes in more than one room – living room, kitchen and bedroom -, only one Friend is not enough.